Serena Wieder, Ph.D. (Profectum’s Clinical Director and psychologist) redefines the building blocks of development a nd the challenges that derail a child’s functioning and learning. For Wieder, vision and space — what is seen by the eyes, transformed by the mind and experienced as movement, plays a crucial but heretofore underestimated crucial role in the development of a child’s thoughts and feelings. Co-author Harry Wachs, O.D., a pioneer of developmental vision therapy, offers therapy focused on visual/spatial aspects of development supporting cognition. Based on decades of experience, Wieder and Wachs guide therapists and parents in interventions for use at home, school and therapy offices involving affect based DIR Floortime® model approaches and other problem-solving experiences, addressing unrecognized challenges that often derail life competencies, learning and development. 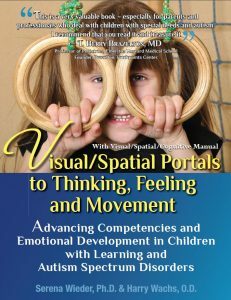 A new step-by-step manual presents tools to develop visual/spatial learning. This groundbreaking book changes the way parents and therapists understand child development and work to promote each child’s potential in meaningful ways. Dr. Serena Wieder is the Clinical Director of the Profectum Foundation dedicated to the advancement of individuals with special needs through training and educational programs. Dr. Wieder co-authored Engaging Autism, The Child with Special Needs and Infant and Early Childhood Mental Health, with Dr. Stanley Greenspan. They founded the Interdisciplinary Council on Developmental and learning Disorders (ICDL) and Dr. Wieder directed the DIR model Institute. She also serves on the Board of Zero to Three – the National Center for Infants, Toddlers and Families and the Scientific Advisory Board of First Signs. Dr. Wieder conducts national and international training, has served as faculty in multiple training programs and publishes widely. Her research has focused on diagnostic classification, emotional and symbolic development, and the long term follow up of children treated with the DIR model approach. She also co-chaired the ICDL Diagnostic Manual for Infants and Young Children and the 0-3 Diagnostic Classification of Mental Health and Developmental Disorders. Dr. Wieder currently practices in New York City. Dr. Harry Wachs, a developmental optometrist and pioneer in visual cognitive development and training, brings over fifty years experience to the treatment of learning and autism spectrum disorders. His work with Dr. Hans Furth, a Piagetan psychologist, led to the now classic work Thinking Goes to School. Dr. Wachs started the Visual Cognitive Developmental Center in 1952 where he treated countless numbers of children with learning disabilities, cerebral palsey, and autism. He has collaborated with Dr. Wieder for many years and has provided training worldwide addressing learning challenges, developmental syndromes, autism and consulted with major football teams. Dr. Wachs has been honored by the college of Vision Development and brings the culmination of his life’s work to this book.